Here’s the ‘brilliant or bad idea’ piece early on in the weaving. I am loving it. 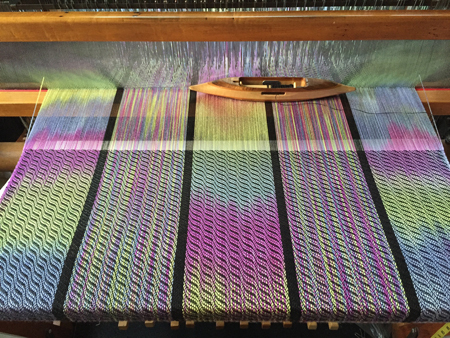 However I know from experience that what I love on the loom isn’t always what I love once it comes off, is finished, and I can see the whole of it from a distance. In this particular case, I think I’ll weave the second piece with a natural/white weft, maybe in cotton, to tone the colors down a bit,…may be too intense for some folks. With the black weft, I kept trying to think of what it reminded me of: stained glass windows? Wrong color schemes. Kaleidoscopes? Not enough shifting of colors. This afternoon I think I got it. Although I’ve never seen them in person, it reminds me of photographs and videos I’ve seen of the northern lights. To those of you who have actually seen the northern lights, does it give you that impression or no? Regardless of what they remind me or you of, I will say, I will say that so far, this concept seems brilliant to me, and I plan to do this again. Time will still tell. I’m now thinking I’ll make one shawl, one wrap, and one other sewn piece – a 30-minute jacket. Trust me when I tell you this site doesn’t do it justice. I’ve got one pinned with a cotton warp and weft, and it’s pretty great. It’s really interesting looking – can’t wait to see it sewn up. I’ve made that 30 minute jacket only I called it a shrug, had even been thinking lately that I need to make myself one in the not too distant future. Thanks, Cindie. I’ve modified the 30-minute jacket slightly, using a longer piece of fabric and making lapels. May (or may not) include a button and buttonhole. I don’t see why you stopped thinking of stained glass. Modern pieces are very like this. I think it’d be more like stained glass if I had used a different weave structure – like a diamond twill or something – not the waves I used.